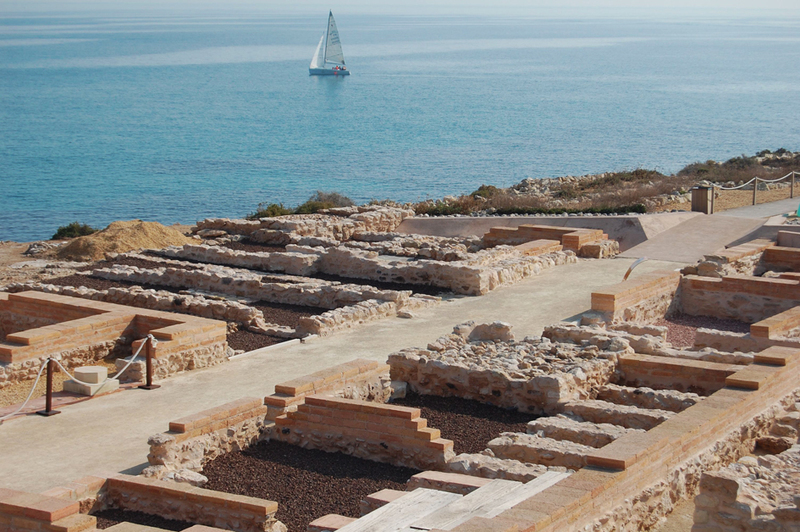 Illeta dels Banyets is one of the most known and earliest excavated archaeological sites of Alicante. 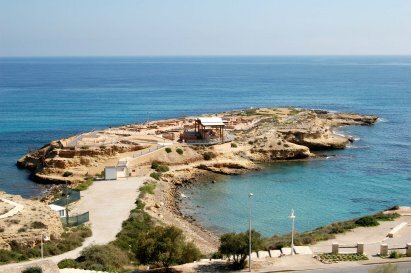 It is located in the municipality of Campello, about 9 kilometres away from the city of Alicante. 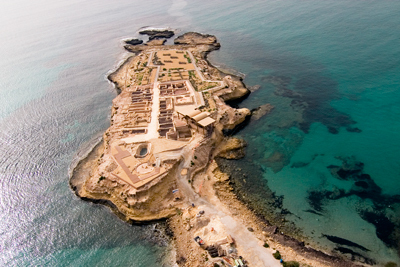 Illeta del Banyets is an old peninsula, which an uncertain time ago was torn apart from the coast due to an earthquake. As a consequence of this earthquake, the part that kept it to the soil was eroded and destroyed. In 1943, it was linked again to the soil, becoming thus part of the natural finger pier. In order to achieve this, dynamite was used, destroying a large part of the prehistoric necropolis. Currently, Illeta dels Banyets is a narrow and long promontory with a surface of 10,000 square metres, 4,000 square metres of which make up the archaeological site, which reaches its peak point at a height of about 7.8 metres above sea level. In spite of its reduced extension, this site is of great importance due to its huge cultural blend, because it hovers remains of the Bronze Age, prior to those that constitute an Iberian site, where remains of a Roman town can be found. Furthermore, remains of Islamic constructions tell us about a temporary occupation during the Medieval Ages. All these proves that Illeta dels Banyets was an important commercial port, from which it was possible to dominate the maritime ways as well as those ways which permitted to penetrate into the interior. The first evidences that prove an occupation go back to Prehistory, more precisely by the end of the Neolithic, during which the inhabitants lived in oval shaped cottages, which some have remained until our days. Subsequently, during the Bronze Age, two large underground tanks partly excavated in the rocks, around which entombments and housing structures were built. Inside the tombs, metal punches and knives, marble bracelets, knobs and buttons and some ceramic glasses have been found. The following level is the Iberian Age, which reaches from the 4th century to part of the 3rd century B.C., during which a very important township developed. Only a small part of this township has been excavated. On both sides of a street that stretches along the length of the island, the visitor can see: two temples, storage houses and housing estates, some of them of great architectural complexity. Due to these buildings' singularity and their rich variety, this core can be interpreted as an emporium, an important site of commercial exchange. On solid ground, next to the tower dating from the Modern Age, a pottery has been discovered destined to produce Iberian amphorae, where several ovens have been excavated. The highest level is constituted by the Roman Age, dating from between the 1st and the 2nd century. On the foundations of the abandoned Iberian township, a Roman city was built, with annexing thermal baths. Not many remains have been preserved, although it is possible to distinguish the residential area of the owner (pars urbana) and another area related with agricultural activities (pars rustica). A very simple thermal building has been found, which is located in a narrow warehouse. Inside of it, the oven, the hot lounge, the tepidarium and the frigidarium - apodyterium are aligned. The remains of a series of fish bins, which were cut in the rocks and connected to the sea through a number of trap holes date also from this age. The fish bins. One of the most important activities developed in this part of the Roman Empire was the exploitation of the sea resources, and more specifically the fish preserving and stock ponds. Several fish preserving facilities are known in the province, the most important is the one located in Portus Ilicitanus. The fish bins that still are preserved on La Illeta dels Banyets, have suffered much erosion by the sea. They are constituted by four pools, which are connected to each other. The dimension of the largest is 8.7 x 3.10 metres and seawater pours in through two channels located on each side. The other three pools, smaller that the first one, are aligned at right angle to the largest. They are connected to each other by vertical slots, which are cut in the rock. This mechanism was simultaneously used to facilitate the opening and locking of the gates.